This man's name was John Todd and admittedly he did not hold a candle to John the Baptist, whom Jesus said that there has not risen a greater of them born among women. Nevertheless, he was chosen by the Lord to deliver a message of warning to the Lord's children, tarnished vessel though he was. 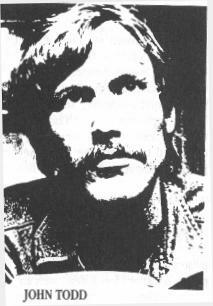 John Todd was a mysterious man who appeared on the scene around three decades ago. He has all but been forgotten these days. For those who do remember him, he was quite controversial. I like to remember him as a man ahead of his time. John was born into a powerful Illuminati family and rose up through the ranks until he was invited onto the Council of 13 or the Grand Druid Council. On this council, he was privy to a lot of those hush hush plans that are on the agenda of the Ring-knockers. It was at this stage in his life that the Lord called him away from the wickedness he was in and so he defected and became a Christian. Todd then went traveling, telling his story. And what a story it was. It brought him some friends, some detractors and many enemies. Illuminati agents posing as Christian ministries, immediately went into action maintaining damage control. Too many people and plans were being exposed. He was hit from many different angles and I am unsure whether he ever fully recovered from the Blitzkrieg. Todd had exposed Chuck Smith of Calvery Chapel and their Jesus Rock movement, Maranatha Productions --and the whole idea of getting the world's music into the churches to water it down and make it a worldly church. Needless to say, Smith hit back. He didn't like people knowing that he'd accepted a multi-million dollar bribe. And then came "Christian" magazines like Cornerstone, Moody Monthly and Christianity Today running professional smear campaigns against Todd, then others joined in. Today, these same magazines give the church a constant diet of spiritual cotton candy, causing it to get weaker by the day. And Smith's organization holds large crusades under the direction of men like his right-hand man Greg Laurie. An abundance of the youth always show up to these "harvest' crusades mainly to hear some loud contemporary Christian rock band play, then Greg or another speaker gives a short pep-talk type sermon. And apparently, large numbers of people are getting saved. Two words best describe this type of Christianity, which Chuck Smith helped to pioneer..."emotionally based." Such a belief system is dangerous and can easily be deceived. Smith also dictates a mandatory acceptance by his ordained ministers within the Calvery Chapel organization of the fly away pretrib rapture nonsense, which also makes his followers feel good. Worthy of note is the fact that Christianity Today which vociferously attacked Todd's creditability, was founded by the 33rd degree freemason and Illuminati kingpin Billy Graham, who also utilizes the loud "Christian" rock bands in his crusades (this is covered in Billy Graham and His Friends by Cathy Burns) . By the way, Todd did also expose the fact that Cyrus Scofield, the great prognosticator of the rapture doctrine, was actually a Jesuit puppet. I came to similar conclusions myself after doing some independent diggings into Scofield's life. Currently, while those wolves mentioned above and quite a few other infiltrators are making sure the church stays asleep (notice that I didn't say they were 'putting the church to sleep' --because that's already been done) many of the things that John Todd predicted would happen have actually been happening and are now taking place. The truth is that over the years there have been quite a few who have taken Todd's material and borrowed it and applied it to their own research without ever giving him any credit. Perhaps they feared that if they acknowledged him, his reputation would cause people to take a dim view of their own work and perhaps they were just glory hounds. Shame on them either way. There was a man making the rounds on the Prophecy Club a few years ago named Doc Marquis. He had a similar story to John Todd's; one of escaping out of an Illuminati family and becoming a Christian. I was initially impressed with him until I found that virtually all of his "revelations" had already been available for years from a myriad of sources; not the least of which being John Todd. For instance, John Todd explained that the Illuminati had successfully carried out a program to establish witchcraft in the military. Twenty Five years later, Doc Marquis made that same revelation. These same parallels also applied to explanations of the Illuminati hierarchical structure, their history and some of their plans. I met Doc in person once and talked to him several times over the phone thereafter. I could never get him to divulge anything that wasn't already 'declassified' (in other words, it was publically available somewhere). Doc did once act as if he were giving me some insider information when he told me that Jimmy Carter's sister Ruth Carter Stapleton was the most powerful Illuminati witch in America while Jimmy was president. Wouldn't you know that John Todd had said the same thing many years beforehand. To me, Marquis appears to be a part of an Illuminati project I have labeled Operation Pace Car. They know that their enemies are studying them. This doesn't bother them as long as they can control the rate of information dispersed. Why not take old declassified info and tout it as the latest scoop. This is similar to the CIA tactic known as chickenfeed. I spent a chunk of change to acquire just about all of Marquis' materials. It was all chickenfeed. Save your money. The last I heard about Doc, he was working on a project to reveal the top six organizations that are working to bring in the New World Order (CFR, UN, Bilderbergs, Club of Rome, RIIA, and the Trilats). This is something that Stan Deyo had already written about twenty years prior in his book The Cosmic Conspiracy. Actually, I should not be so tough on Doc. He is probably still under mind control and just carrying out his programming. I bring all of this up to help show that John's message is being verified, perhaps even by the Illuminati itself. Back to John and his message. A relevant portion of what John warned about was contained on a taped talk he gave at a church meeting in the late '70's---one of the most widely circulated messages he gave. It was through providence that my family found a tape copy of this message in a beat up old car where my dad worked as a mechanic. That tape definitely made an impact on my young impressionable mind and eventually stimulated my parents to try and locate him. We found out he was in Columbia, South Carolina and began to correspond with him in the mid '80's. We found him faithfully serving the Lord with a revived ministry ( here's an order form that he sent us featuring some of his art work , which I have scanned in for those with a nostalgic interest) after having suffered the slander and many attacks of the enemy, abandonment from those he trusted and confusion from the mind control programming. Only the Lord can bring someone through so much. It was unfortunate that he was arrested shortly afterward and was framed and sentenced to a long prison term. I am told that not long after his release, he was taken out and murdered by those who conceal themselves behind tall oaken doors, who being goaded on by their split-hoofed master, plot and scheme such frightful and shocking plans, that none would dare reveal these unspeakable things, save they had the courage of a man like John Todd. (Since originally writing this, it has been brought to my attention that there are claims that Todd is still alive and in prison. See http://www.kt70.com/~jamesjpn/articles/john-todd-now.html). Let's go over the things Todd talked about on the above mentioned tape. First he stated that the events he would describe, involving the destruction of America and the rise of the Antichrist, would take place within an eight-year timeline, ending in 1980. This obviously did not happen in the time limit that he gave. However, I do not discard all of his claims merely because his dates were off, knowing that the illuminati works off of tentative timelines that are flexible and not etched in granite. Perhaps his outspoken forewarnings had something to do with the delays in their plans---I don't know, but I'm thankful for the extra time. Aside from necessary modifications over time, their plan has remained very much the same as that which was revealed to John Todd. Having said that, I would now like to point out that in the scenario he gave, he accurately predicted the air traffic controllers strike of 1981 three years prior to the event. He also predicted more strikes ( audio clip ) to take place from the major industries, coal miners and long shoremen like the ILWU strike that just took place on the West Coast this last year. These are all Illuminati orchestrated and you can expect more major ones to take place as they start accelerating their move to take the country down. The unions are largely run by communist factions now and have taken on many communist ideologies over time---they will play an important role in the coming revolution in America just as orchestrated worker strikes (and sabotage) did in the beginnings of the Bolshevik Revolution in the city of Petrograd, Russia in February of 1917. Russia was engaged in a bloody war with Germany at the time, and the protestors were shouting "Down with the war!!" and "Down with the autocracy!!" , with the momentum bringing on the revolt 6. I felt it worthy to note this as the President is almost single-handedly dragging this country into a war with Iraq amid a swarm of opposition. Another historical example of this that can be cited is when Moscow's Communist cells operating in Spain were making the same use of the radical labor unions there in order to contrive the Spanish Civil War 7 (for related info on this tactic, see syndicalism). These unions that were utilized in Spain included the Spanish Communist Party (Partido Comunista de España) created in 1921, and the Unified Marxist Workers' Party (Partido Obrero de Unificación Marxista) formed in 1935. Please note that this is not an across the board condemnation of unions as a whole, nor a minimizing of all the good that they have done here or in other countries. A union is like a high-caliber revolver. It is powerful and can be used for good or evil depending upon whose hands it's in. I'm assuming that it is a given that the reader already knows that communism was founded by, financed by, and is under the total control of the Illuminati. Their principles and goals are identical. As a matter of fact, Karl Marx was only a front man who copied the ideas of the founder of the Illuminati, Adam Weishaupt. They have been using and will continue to use communism to destroy America as we know it. Now that we know a little about John Todd, Who is John Galt? More bankruptcies are coming, and you can take that to the bank...if you get there before it declares a Bank Holiday and closes its doors for good. You have two choices. Get your money out of the system or kiss it goodbye. John gave one final cryptic quote ( audio clip ) in regards to his discussion of Atlas Shrugged, saying " Now the book ended, Atlas Shrugged, the timetable ended with this... 'When the lights of New York City go out for the last time we will have the world.' " When I first heard that, I thought it probably had something to do with planned power outages in New York. However, in light of the attack on NY on September 11, 2001, and taking into consideration the prophecies and visions of men like Dumitru Duduman, David Meyer, A.A.Allen, Heny Gruver and others, I am convinced that it means the nuclear annihilation of New York City. There is a credible hypothesis adhered to by many that with the destruction of the UN headquarters in NY and with America crushed, the UN would then be moved to Jerusalem, where its leader will rule the world unhindered. To briefly highlight on a few other forewarnings from John that happen to be hitting bull's-eyes. 1) He warned about the draconian gun control laws long before there was any major concern over the issue. 2) He warned about Operations Gardenplot and Cablesplice and the plans to put New World Order resistors in internment camps before the militia movement even existed in this country 8 3) He even spoke of the dreaded coming martial law while Alex Jones was learning to ride his tricycle. John Galt is merely a character in a fictional novel entitled Atlas Shrugged. He is not important, but the book is pertinent here to some degree. According to Todd, it was written by a mistress of Philip Rothschild under his orders as a coded blueprint of how these bad guys were going to take over the world. The plans in the book call for everything from derailing trains and blowing up grain mills to destroying oil fields and shutting down the coal. Some of these activities, I fully expect, are still scheduled to be carried out by the terrorist cells in this country. From several intelligence sources now, some reliable some not, this list can be updated to include release of biochemical agents, anthrax, smallpox, attacks on power plants and water supplies, even suitcase nukes, etc. Next, John explained how they would intentionally bankrupt their own corporations--all as part of the plan to collapse the economies of the world ( audio clip ). We know that this must take place so that a new cashless economic system could be implemented.